Orga’s high, medium and low intensity obstruction light solutions are used all over the world to make high-rise structures like towers, skyscrapers, bridges and offshore structures, more visible to passing aircraft. Our L85SA-R and L85EX-R product series are part of our broad, pioneering range of aviation obstructing lighting. Products in the latter of these series, the L85EX-R, are also explosion proof. Battery-operated back-up systems, visibility sensor systems and controllers with advanced communication interfaces are available to complement your Orga aviation warning lights system. Why do you need low intensity obstruction lights? 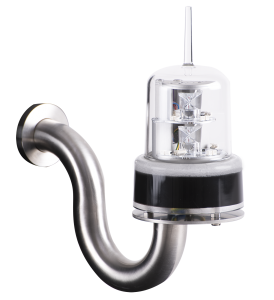 In our L85SA-R and L85EX-R product series, we have developed a new generation of low intensity aeronautical obstruction lights to meet the most demanding offshore applications and situations worldwide. The Orga L85SA-R and L85EX-R series both provide steady red light under the most adverse of environmental conditions. Aircraft warning lights in the latter series, the L85EX-R, are certified for use in zones 1 and 2 gas explosion hazard areas. Operational safety underpins the offshore industry and the licences you must have to operate in it. To maintain these licences, you need an up-to-date obstruction light system that meets your operational needs and complies with the most stringent of national and international regulations. To broaden your choices, and thus meet all your operational requirements, we offer AC and DC versions in 10, 32, 50 and 200 Cd intensity light in both the L85SA-R and the L85EX-R series, making a total of 16 low intensity light products. We also work closely with international regulators and civil and military aviation authorities to design and develop our obstruction light systems. And last but not least, we are familiar with the latest international and national regulations and safety standards. At Orga we can not only help you meet these challenges, we can help you stay ahead of them. Why choose Orga’s low intensity lights? Over 40 years of experience, coupled with our in-house research & development department and manufacturing facilities, make us a strong and reliable partner. But never a complacent one; we work closely with our customers to continuously improve and expand our products. In our low intensity lights, we offer you reliability, low cost of ownership, low power consumption, easy serviceability and the maximum interchangeability of parts. 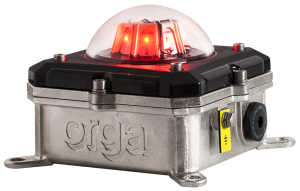 In combination with compact design, robust stainless steel build and easy access, Orga’s Low intensity obstruction lights are the best choice you can make.